Procedure: Clean and wash the scallops. Put them in a cutting board and slice lengthwise thinly. Arrange the slices on a serving dish, marinate it with truffle oil, lemon and chopped chives. Leave it in the fridge for few hours. Clean the mushrooms and cut into small cubes like a tartare. Do the same thing with the hazelnuts and the spring onion. Mix everything together, season it with a pinch of salt, pepper and hazelnut oil. Place the scallops on a plate, add crystal salt and pepper. In the same way, to the side, place the mushroom tartar and a bit of seasoned mix leaves. 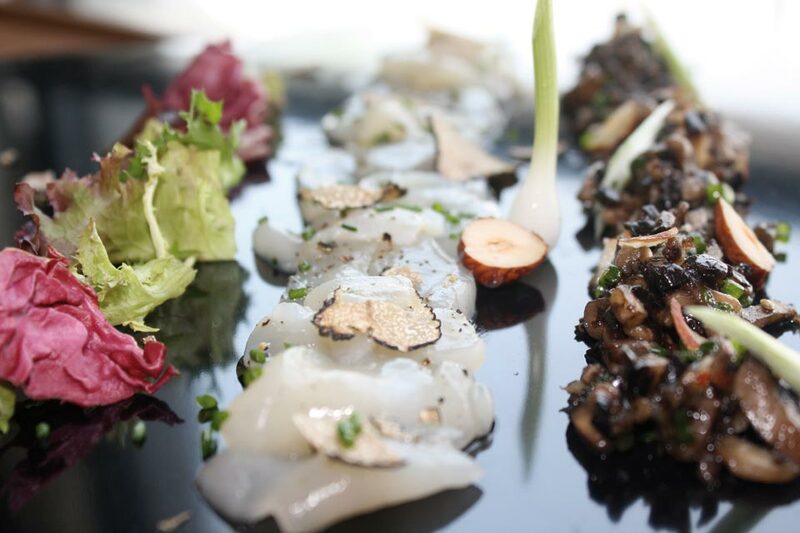 To finish up, with the use of a mandolina, slice the black truffle over the scallops and the salad. Dish is ready to serve.